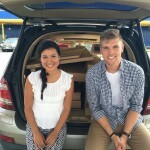 Meet Monica Villafuerte and Daniel Croson! Monica is the founding principal of Cresthaven Academy, while Daniel heads up Cresthaven Academy Foundation, the non-profit organization which oversees after-school programming for our scholars. Follow their adventures in preparing for our official school opening in August 2016! Today’s stop? IKEA, for all of our office furniture needs. If only assembling it were so easy!